The discovery of mRNA splicing in 1977 established a new step in the central dogma of molecular biology, the “flow” of genetic information from DNA to RNA to the protein product. Our meeting will focus on forty years of advances in this field with topics such as the spliceosome, alternative RNA splicing, diseases related to RNA splicing, and therapeutics focused on RNA splicing. The meeting will encompass discussions not only of what has already been accomplished, but also how this history continues to shape the future. Meeting is organized by Mila Pollock, Cold Spring Harbor Laboratory, Phil Sharp, Massachusetts Institute of Technology, & Joan Steitz, Yale University / HHMI. mRNA splicing is essentially the editing of the precursor mRNA transcript copied from nuclear DNA into a mature mRNA molecule that can then be translated into a protein. 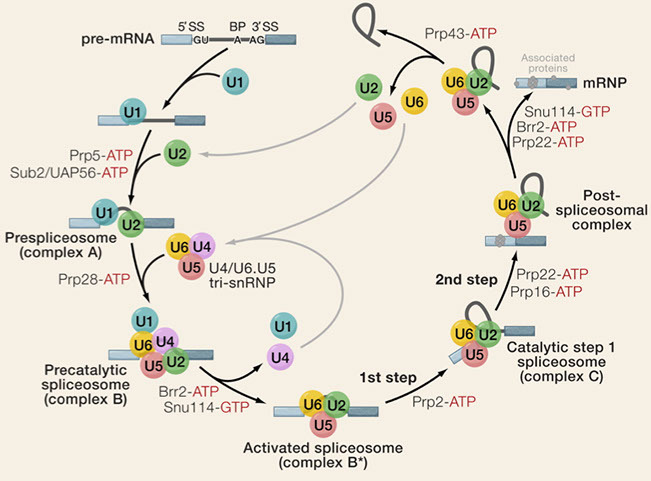 Key to this process is the spliceosome, an RNA–protein complex that catalyzes the splicing reactions. Since its initial discovery in 1977, mRNA splicing has been revealed to be exquisitely complex as new technologies have evolved to study it in closer and closer detail. The mRNA splicing process plays a large role in a wide range of diseases, including motor neuron diseases, muscle degenerative diseases, retinopathies, and cancers, to name a few. Disruptions in the splicing process via mutation have been estimated to comprise as much as 50% of human disease mutations. Deciphering the mechanisms of these mutations is essential to developing effective therapies that can correct or inhibit the resulting pathological splicing events. Remedies being explored include antisense oligonucleotides, RNA-binding molecules, and chemicals that interact with splice site selection. This meeting is the seventh in a series organized by the CSHL Meeting and Courses Department together with Genentech Center for the History of Molecular Biology and Biotechnology. We have invited speakers who made many of the seminal discoveries that began the field, as well as those who are working in the field now. Like the previous meetings in the series, this meeting will provide an excellent opportunity to look in depth at a topic and to share the stories that are often missing from academic accounts.